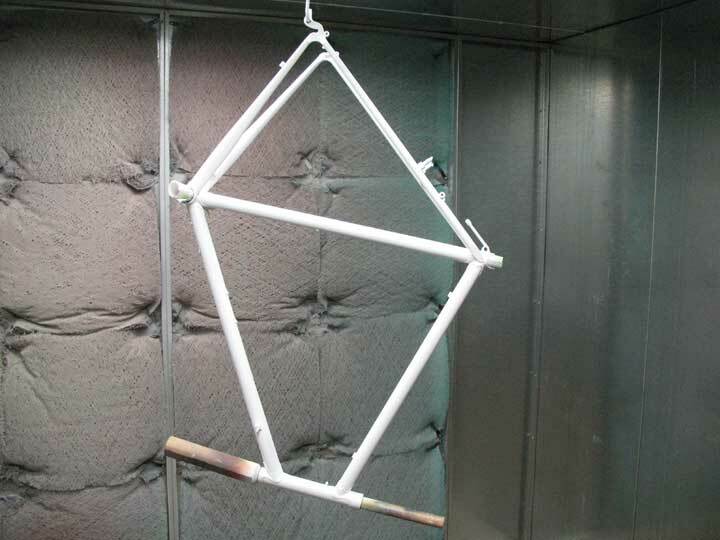 This frame was just sprayed with an epoxy primer. The epoxy primers are really good at sealing up the tubes from moisture and stay put extremely well. Even if the paint/clear chips off the primer stays on. This is important in preventing rust. The frame bakes at 140 degrees F for 40 minutes. Then the primer is ready to be sanded with 400 grit. This ensures the base coat will go on smoothly and adhere well. After the paint job is complete the primer will be covered and go unnoticed. But the primer is the foundation of the paint job and like all foundations are very important to the finished product.